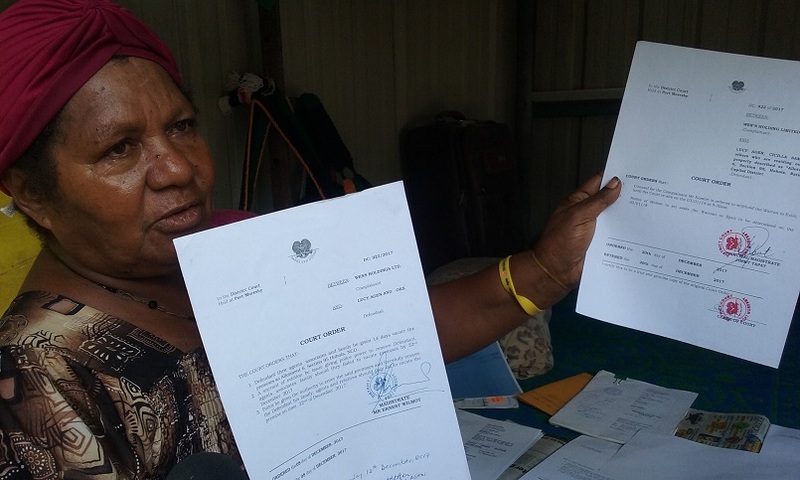 The two families who were evicted from their homes of more than 30 years in Port Moresby have been allowed to return to the properties at Gordons. This newsroom today visited tenants Lucy Agen and Cecilia Sam, along with their families. They have since moved back into the properties after the Port Moresby District Court on December 26, nullified the eviction of December 24 and stayed the Warrant of Eviction that was issued by the court on 8 December. That warrant has been stayed pending the outcome of a National Court proceeding regarding the subject property, Section 95 allotment 6 between the tenants and the owner of an Asian shop, who is alleged to have acted illegally in obtaining the title. Police and the agent and servants of the shop owner have been restricted from entering the premises and further restricted from assaulting, harassing or interfering with the families until January 3, 2018 when the matter returns to court. A motion seeking to set aside the warrant of eviction that was issued by the Port Moresby District court will be heard in court then. Tenant and retired National Housing Corporation staff, Lucy Agen is also claiming that their valuables that were taken away in a truck on Christmas Eve have not been returned. Food warmers from their tucker shop in front of one of the properties were also damaged. Police could not be reached for comments regarding the valuables.